The state park features an architecturally intriguing Interpretive Center that reflects the layers of history at the Falls of the Ohio. If you are an outdoor enthusiast and enjoy nature exploration, the Falls of the Ohio State Park is for you! Come discover 390 million years of history from the Devonian sea creatures to life at the Falls today! Those who visit the Falls of the Ohio State Park and Interpretive Center know that they are in a special place. It doesn’t take long to appreciate that the Falls of the Ohio is a place of historical, cultural and geological significance. 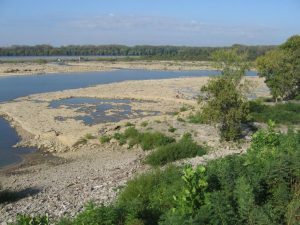 What many do not realize is that the Falls of the Ohio is also a place where you will discover an abundance of wildlife and ancient fossil beds. That was validated in 1981 when the U.S. Congress designated the Falls of the Ohio as a National Wildlife Conservation Area (NWCA). The Secretary of the Interior assigned responsibility for management of the NWCA to the U.S. Army Corps of Engineers (Corps). The objectives of the 1,400 acre NWCA are to 1) protect wildlife populations and habitats; 2) conserve fish populations; 3) ensure necessary water quantity within the NWCA; 4) protect the fossilized coral reef as a unique paleontological feature; and 5) protect natural resources and provide research and interpretive opportunities. The Falls of the Ohio is considered one of the region’s outstanding destinations for bird watching where visitors can see bald eagles, ospreys, peregrine falcons, egrets, herons, among many other species. The Corps operates the McAlpine locks and dam on the Ohio River to ensure safe navigation for river traffic. As birds and other wildlife depend on available water, the Corps has provided openings (castellations) in the dam to allow water to flow through to fill the pools below. The Corps is updating the master plan for the NWCA. The Corps recently held public meetings to solicit new ideas and guidance on future management of the NWCA. Meeting participants expressed a desire for outdoor recreation opportunities at the NWCA. Stakeholders are most concerned that the natural resources including the ancient fossil beds, and the habitat that supports wildlife is protected for future generations. The Falls of the Ohio has the distinction of being the only NWCA designated by the U.S. Congress under the Corps jurisdiction. This NWCA is truly unique, and one of the reasons that make the Falls of the Ohio a special place for all to experience. Start planning your next trip today! ©2019 Falls of the Ohio Foundation. Made possible with support from our donors.